Chocolate flavoured toasted rice cereal and milk bar. *Source: Independent survey by MMR, March 2018. Food research conducted on 160 children in the UK. Children rated the bar 8.5/10 on average. **Source: Independent survey by MMR, March 2018. 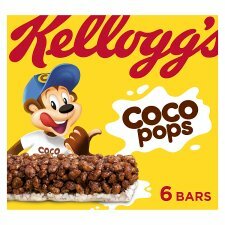 8 out of 10 UK mums approve the new Coco Pops recipe for their children. Online survey with 200 consumers.